When discussing the subject of abandoned places in Ohio it usually isn’t long before the topic of conversation turns to a place called Hell Town. What can you say about a place called Hell Town? Like the guy in the commercial says, with a name like that, it has to be good. Right? Well honestly, it's hard to say. "Hell Town," while one of Ohio's most famous horror/supernatural legends, is also one of the most confusing. It's a good example of the way folklore can get really complicated and convoluted. There's no single haunted farmhouse here, no headless train conductor or ghostly children running around in the woods. Hell Town is home to six or seven separate legends, each with dozens of variations in its own right. All of which has led this area in Boston Township to be grouped as one haunted site and given an evil-sounding name. 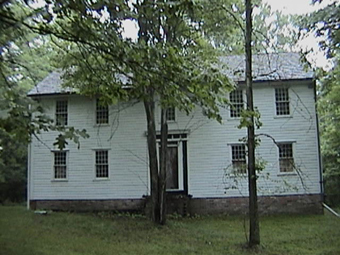 It is a dark, foreboding place where ghosts, cults, and even a serial killer were said to lurk. People will tell you the entire town was cursed, warning that it was dangerous to be in the area after dark. Needless to say, we were intrigued and wanted to learn more. In the summer of 2001, we made our first visit to the area known as Hell Town. You may be surprised at what we found. Hell Town is a nickname given to the northern part of Summit County. The areas most often associated with the Hell Town legends are Boston Township and Boston Village, as well as portions of Sagamore Hills and Northfield Center Townships. In most of the legends, all of these areas are combined into one large region, which is referred to as Boston Mills. First settled in 1806, Boston stands as the oldest village in Summit County. The first mill was built in the village in the early 1820’s. Several years later, the construction of the Ohio & Erie Canal brought more people to Boston and over the next few decades mills began to flourish in the area––most notably a paper mill. When a railroad station was constructed in the town in the early 1880s, the station was named "Boston Mills," in reference to the paper mill, and the name stuck. Over the years little changed in the small town. However, in the late 1960s, a nationwide movement began that expressed concern over the destruction of our forests. In 1974, in an effort to save the forests, President Gerald Ford signed legislation that enabled National Park Services to purchase land and use it to create national parks. As a result, on December 27th, 1974, hundreds of acres, including land within the Township of Boston, were officially designated a National Recreation Area. What many people did not realize until it was too late was that this legislation had a darker aspect to it. It gave the Federal government jurisdiction to buy houses and land right out from under the current owners in order to clear the way for the national park. Almost immediately after the bill was passed, the government began acquiring houses throughout Boston Township and the surrounding area. Once the government had decided to buy a property, there was no negotiation involved––the owners were forced to relocate. In what can only be described as a mass evacuation, residents began leaving in droves and entire townships began to be swallowed up by the Cuyahoga Valley National Park. These events were so tragic that they were featured in the 1983 PBS documentary "For the Good of All." Perhaps the general feelings of the displaced homeowners were best summed up in a statement found scrawled across the wall of a vacated home: "Now we know how the Indians felt." Once a house was bought by the government and the owners left, it was boarded up and covered with US-issued "No Trespassing" signs. Then it would sit vacant until the government could arrange for it to be torn down. In some cases, houses were intentionally burned to serve as training exercises for local fire departments. With hundreds of homes being purchased in such a short period of time, the government quickly fell behind and it was not uncommon to drive down a street and find several boarded-up houses sitting next to the burned-out remains of other ones. To a passing motorist unaware of the events taking place in the area, it could easily have seemed as if an entire town had mysteriously disappeared into thin air. "Mutant Town" and "Mutane Town" are two alternate names for the Hell Town area. 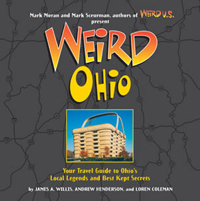 Research on the stories has led us to conclude that the area was first called "Mutant Town" when the federal government bought up the land in 1974 to create the Cuyahoga Valley National Recreation Area. They boarded up most of the houses they bought and put US Government "No Trespassing" signs everywhere because there had been a chemical dump in the area. So naturally everyone assumed there were slimy mutants wandering around murdering people. "Mutane Town" seems to be a simple misspelling of "Mutant Town," although some people will assure you that there had been a butane plant in the area, which somehow led to this name. Unfortunately, that's not true. Neither is it true that there was a chemical spill in Boston Township. This one goes along with allegations of Satan worshipping made against the entire town. We’ve been told that all the people in the area worship the devil, and that there are animal mutilations and satanic symbols all over the place. All of which leads to the church, which is called Mother of Sorrows in the real world. Supposedly, black masses are conducted here, and there are supposed to be upside down crosses all over the building. As it turns out, the upside down cross shape is just a feature of gothic revival architecture. You have to think they could have been a little more careful when they were building the place. There are lots of ghost stories that emanate from the scary cemetery, which is said to be terrifying, and the home of a ghost who sits on a bench and stares out into space. From what I hear, though, there's no bench, and the cemetery is pretty ordinary. Lately the Boston locals have installed floodlights and patrol the graveyard regularly, so if you're planning to visit at night, be careful. This story has some creepy elements. A haunted school bus with all the seats removed is said to sit at the edge of the woods in Hell Town. Legend has it that the kids it was hauling on its last trip were killed by a crazy killer or bunch of crazy killers. They say sometimes you can see either the kids or their killer/killers inside. If it's a single killer, he sits in the back, smoking a cigarette. However, the truth is unfortunately much more mundane. A guy who was repairing his home lived in the old bus with his family until they could move into the house. The bus has since been towed away. There is a steep, winding road with a sudden stop that is called "the end of the world" road. It's actually Stanford Road. Nothing too supernatural here, although you'll hear some weird rumor or another occasionally. Apparently there is a good dropoff near the road which creates the illusion that you're driving next to a much larger chasm. Legend has it that you'll be chased by a hearse if you go to Hell Town. A local guy did own a hearse for a while, but we doubt he chased very many people with it––although that does sound like fun. We've received e-mails from people who claimed to actually have been chased by the spectral hearse, which then disappears. There's a slaughterhouse not far from the cemetery––or so it is said. Researchers report that it's just part of an old barn. Over time it acquired a reputation as a haunted slaughterhouse where you would see faces if you looked through the windows at night. There definitely are real abandoned houses still remaining in Boston Township, since the powers that be envoked eminent domain to take so many and then demolished them. We've heard a first-hand report about one being haunted, and also that the local boarding house is mistaken for one. A suicide even occurred in one in 2004, adding to the area's spooky reputation. Surprisingly for an area known as Hell Town, the devil doesn't seem to show up particularly often. Despite the black masses given in his honor, and the offerings of mutilated farm animals, he hasn't deigned to appear to many people in the area. Maybe this is because Boston Mills residents ran him out; the locals there are apparently quite sick of their largely unremarkable corner of the state's reputation as a satanic hotbed, and the area police have cracked down on nocturnal sightseers. They insist there's nothing to the horror stories. Whether they're right or not, it's certainly a fascinating (if confusing) bit of local folklore. I have traveled to the End of the World. I speak of the end of the world I have come to know, the one that is a portion of the scariest place I have ever visited, Helltown. 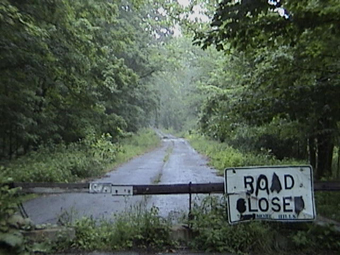 Formally known as Boston Township, Ohio, Helltown is a little rural town, partially abandoned, and is home to many mysteries. I have experienced much in my explorations of there, some of which I don’t care to remember and some of which I can never hope to explain. Helltown is not truly abandoned. It does have residents, but they are a strange and frightening breed. I have gone exploring the woods and cemetery of the area in the late night and wee morning hours, and have returned to my car to find strange people looking into its car windows. This has happened twice––once at 2:00 AM and once at 4:30 AM. Both times, the people fled as soon as they saw me approaching the car, before I had a chance to speak to them. Both times, they were dressed in all black. A part of me is glad that I didn’t get to converse with them, because I have heard too many tales about the ways of Hell Town residents. Supposedly, they are all Satanists, and worship at the town’s two evil churches. I have been to both of these churches, however not inside them. One, the Mother of Sorrows, has upside down crosses hanging from it. I have also been to the Boston Cemetery, where a ghost has been seen sitting on a bench. This cemetery is as dark a place as I have ever been. The graves date back to the early 1800’s. I didn’t see the ghost when I visited, but I did hear strange growls and howls from the depths of the graveyard. This was more than enough to convince me to leave, as the prospect of getting attacked by some strange bone yard dwelling beast was not appealing, to say the least. The “End of the World” is a road that has a large hill and dip. It is easily one of the steepest thoroughfares I have ever traveled. I have heard that if you travel this road at a certain speed, it has a certain frightening, even deadly, aftermath. I have never opted to test the fates by speeding on it though. I have traveled it at normal speeds, and can attest to the fact that it is a dangerous looking, freaky road that always leaves me feeling very unsettled. The scariest part of Helltown is no longer there, as town officials have removed it since it attracted so much attention. There is an abandoned house in the woods there, and for years an abandoned school bus sat next to this house. The story of how the bus got back there still gives me chills every time I think of it. The bus was carrying a group of high school students who were going to one of the ski resorts near Boston. An elderly woman flagged down the bus and, in a panic, explained that there was a young boy in her house who was seriously hurt. The bus driver, attemping to help, turned down her driveway and drove into the woods, hoping to revive the boy. When the bus approached the house, Satan worshippers swarmed it and sacrificially murdered all of those aboard. The bus sat back there for over thirty years, standing as a warning to all who decided to venture into Helltown. I saw this bus many times before they removed it, and if was very real and very frightening.